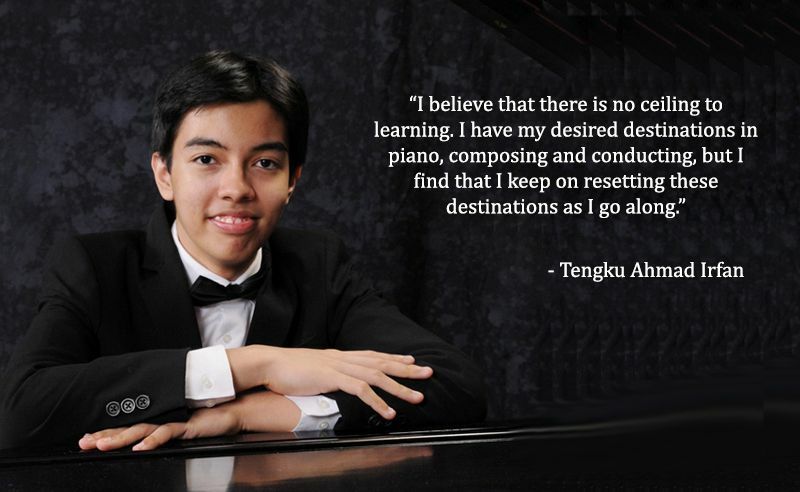 Eighteen may sound like an impossibly young age but Tengku Irfan has spent more than half of that time building, nurturing and polishing his talents as pianist, composer and conductor. At the recent Aspen Music Festival 2016 – a concert extravaganza where master musicians congregate to share their secrets and the good go to get even better – over 30 of the world’s top classical musicians wowed the crowd with a series of performances that illustrated immense skill, passion and talent across equally as breathtaking an array of instruments. Among the thirty on the Guest Artiste list, some of whose ages go up to the 60’s, was 18-year-old Tengku Ahmad Irfan. Eighteen may sound like an impossibly young age (it did after all, make him the youngest on that list) but the Malaysian classical pianist, composer and conductor has spent more than half of that time building, nurturing and polishing his musical talents to bring him to where he is today. Classical music is, to him, a calling that didn’t need a second nudging. Despite the circumstances, classical music found its way to him by means of a gift of an electronic keyboard. Piano lessons started at the tender age of 7 and he has not looked back since. Over a decade on, it has led him to The Juilliard School and the brightest spots on the world’s most renowned musical stages. His journey is, needless to say, one watered with a lot of sweat and painstakingly nurtured with equal parts passion and determination. The past few years have been a delicate juggle of both his academic and musical studies. His decision to branch out into composing and conducting is proof of his yearn to master his craft better. “The passion for composing and interest in conducting have always been there and gradually increased since I started playing the piano,” he tells. This entails even more detailed studying of all the instruments in the orchestra since to compose and conduct, he needs to know in depth how they work together and best orchestrated. But he doesn't see it as work at all. In fact, he cannot be happier than when he is playing the piano. "Music gives me the positive energy to take each day as it comes. Music is also therapeutic for me," he shares. Since starting university level at Juilliard in September, things have become an even more hectic ride but Tengku Irfan is not fazed; in fact, he’s only gotten more driven the harder it gets. His talent and determination are matched only by the tireless hard work and humble gratitude he is partaking his journey with. We saw this for ourselves when we asked him to name a particular moment from his career that he is proudest of. All we got in reply was a short, hurried mention of it being the time he had his orchestral piece titled ‘Vivacity’ world-premiered in Germany by conductor Kristjan Järvi and the MDR Radio Symphony Orchestra. It is only some digging that we learnt that both conductor orchestra are two of the most prestigious in the world and that the venue where the piece was performed – the Leipzig Gewandhaus – is the same one where Beethoven and Mozart themselves have once performed and had their compositions premiered. “It was a great honour to receive a commission by an eminent conductor to compose an orchestral piece for a prestigious orchestra, and also having the opportunity to perform with them in the same concert,” was all he had to say of the remarkable feat. Such recognition despite his young age is far from getting to his head. He chooses instead to focus on his music and count his blessings. These days, you’re most likely to find him learning new piano concerti to add to his repertoire and composing new pieces for a song cycle. He also ensures he is constantly improving by setting realistic benchmarks for himself. While he acknowledges that learning is a never-ending process and bettering oneself no matter your craft is journey that is constantly evolving, he is also a firm believer in patience and taking in all the bad along with the good that comes. “When pursuing your passion, every road is full of ups and downs, but if you learn something from the downs, this learning makes the down become an up,” he says. Two other local names making us proud on the international stage: The designer duo behing Fiziwoo.